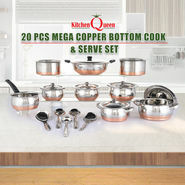 Add grace to your dining experience with 20 Pcs Mega Copper Bottom Cook & Serve Set, an ideal combination of serving and cooking needs in your day-to-day life. 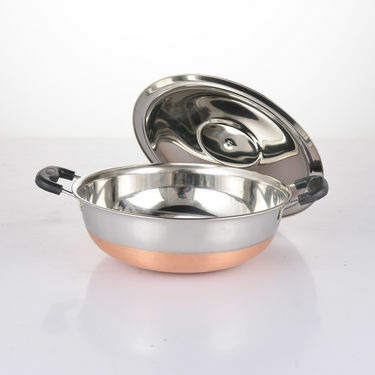 Made from 100% Food Grade Stainless Steel, the utensils has a strong construction and will not bend or have dents during normal use. For good grip and easy handling, it comes with Bakelite Handles. 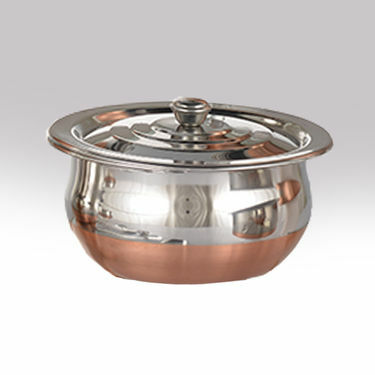 Easy to clean and wash, they have very exotic silver touch design and copper coated bottom. 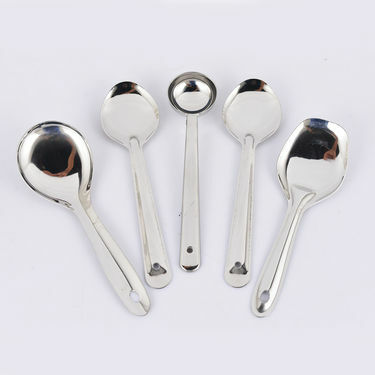 Everybody needs a good kitchen utensil set, whether you are new to cooking or a seasoned chef. And choosing a kitchen cookware that not only does your cooking chore easy but also looks appealing is really a tedious task, isn?t it? 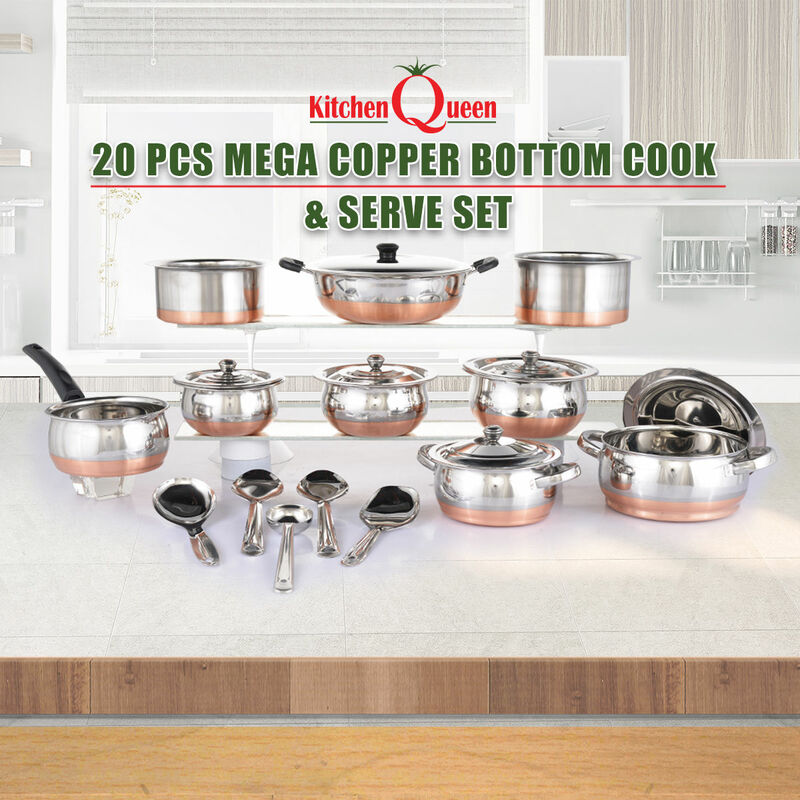 So to make your work easier and to save your valuable time in picking one, we did a quick review on 20 Pcs Mega Copper Bottom Cook & Serve Set. Body Material: Made from high-quality stainless steel, the set can resist extreme heat temperatures without leaving its natural shine even after daily use. The sturdy steel prevents the products from dents and scratches during normal use. Durability: The set is rust-proof and stain-resistant which further adds to its durability. Also, it won't chi, bend, or crack easily keeping its shine over years of use. 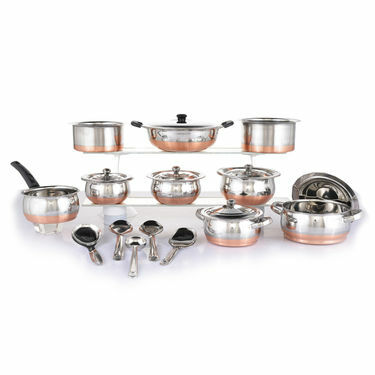 Reviewer: We highly recommend 20 Pcs Mega Copper Bottom Cook & Serve Set, a complete value-for-money let you prepare & serve your food efficiently and hygienically. 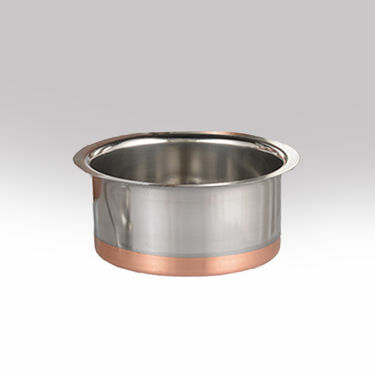 It is definitely a useful addition to your kitchen or a perfect gifting option for friends. 20 Pcs Mega Copper Bottom Cook & ..VS15 Pcs Copper Base Cook & Serving.. 20 Pcs Mega Copper Bottom Cook & .. VS 15 Pcs Copper Base Cook & Serving..
20 Pcs Mega Copper Bottom Cook & ..VS20 Pcs Copper Base Cook & Serve S.. 20 Pcs Mega Copper Bottom Cook & .. VS 20 Pcs Copper Base Cook & Serve S..
20 Pcs Mega Copper Bottom Cook & ..VSMaster 5 Ltr Coloured Pressure Co.. 20 Pcs Mega Copper Bottom Cook & .. VS Master 5 Ltr Coloured Pressure Co..
20 Pcs Mega Copper Bottom Cook & ..VS14 Pcs Colored Stainless Steel In.. 20 Pcs Mega Copper Bottom Cook & .. VS 14 Pcs Colored Stainless Steel In..